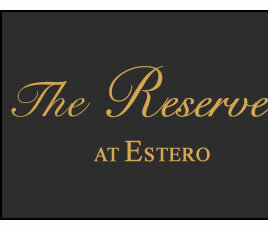 The Reserve at Estero is a vibrant, engaged, and active community in Southwest Florida. Centrally located midway between Naples and Fort Myers, The Reserve at Estero is a community with picturesque open spaces and sparkling lakes. Community amenities include a grand clubhouse with a multi-purpose room, fitness center, aerobics studio, library/craft room, billiard room, and community room. There are tennis courts, a basketball court, pickleball courts, a resort-style swimming pool with children’s pool, spa and playground. Residents enjoy a variety of on-going activities and special events. The 485 single family home community was developed by Toll Brothers and enjoys a gatehouse that is staffed 24 hours a day. The Reserve at Estero offers an ideal location close to Coconut Point Mall, Gulf Coast Town Center, Miromar Outlets, Hertz (Germain) Arena, Florida Gulf Coast University and the spring training facilities of the Minnesota Twins and Boston Red Sox. Additionally, the Southwest International Airport, numerous golf courses, Gulf Coast beaches and all the cultural and recreational attractions of Southwest Florida are just minutes away. Important Lee County meeting on Wednesday, April 17 9:30 am regarding the fast-tracking approvals of lime rock mining applications. Please use the link below for complete information. We welcome our new Property Manager, Mollie Johnstone to The Reserve community. The next Board of Directors meeting is set for April 29 at 6:00 pm in the Social Room. See you there! Lee County Utilities will be temporarily converting its disinfectant process from chloramines to free chlorine residual from May 1 through May 21, 2019. This is a routine measure that is typical for water utilities using chloramines as its primary disinfectant. This could affect those on kidney dialysis machines or have tropical fish or aquatic animals. See http://www.leegov.com/utilities for more information. Check out April 2019 Newsletter now. It includes updates, invites to informational meetings, and current social events. Please log in and go to Newsletters. All landscape service requests (formerly called work orders) need to be submitted directly to BrightView. Please log in and click on BrightView Landscape Service Request. If you need to report a community issue (for example: street lights, downed signs, utility issues, fountain repairs), please go to Property Management Service Request. We can use your time or expertise. Please complete a Volunteer Interest form now. Information for all committees is listed under the the Committee Charter tab. Volunteers are currently needed for the following committees: Community Access & Road Oversight, Hearings, and Rules and Regulations. Thank you!